a 12-string complete with remarkable tone, performance enhancing cutaway, ebony finish and Shadow preamp. Everyone knows that the “King of the Flattops” produces the biggest sound around. Well, now you can get that legendary J-200 sound in a 12-string. Epiphone has also added a Shadow preamp/electronics and a cutaway making this limited edition Ltd. Ed. EJ-212CE a great live performance guitar as well. Since its introduction in 1990, the PR-5E has been the choice of more working musicians than any other Epiphone acoustic electric guitar. To commemorate its continued success, this Limited Edition version Ltd. Ed. PR5-E in beautiful Alpine White was introduced. Countless guitarists have taken the stage with an Epiphone PR5-E Acoustic-Electric Guitar because it has the look, the sound, and the electronics they need. Features a select spruce top, mahogany body, rosewood fretboard with split-diamond inlays, and an Epi-Six preamp with piezo pickup. Building upon the success of their Masterbilt line of professional, all-solid wood acoustic electric guitars, Epiphone introduces the EF-500RCCE. This new “fingerstyle” guitar featuring 1.75″ string spacing has solid Rosewood back and side with a solid Cedar top for rich, warm tone that improves with age and a cutaway that allow for improved upper-fret access. Included is an L. R. Baggs acoustic/electric piezo pickup with electronics. As with all Masterbilts, it features the historic 1930’s off-set peghead, historic Epiphone script logo, mother-of pearl “stickpin” inlay and tapered dovetail neck joint. Included with this acoustic electric guitar is a Masterbilt hard gigbag with hygrometer. 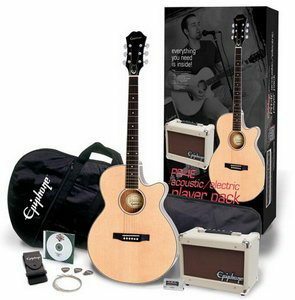 Epiphone introduces its first ever acoustic electric player pack featuring everything you need to get you playing acoustic guitar LIVE! The all-in-one package includes the new PR-4E acoustic/electric guitar with select Spruce top and Mahogany back and sides, an Acoustic-15 amplifier with 15 watts of power, 3-band EQ and Chorus plus all necessary accessories such as a gigbag, tuner, strap and cord. With a “street price” of under $200, you won’t find a better, more affordable a/e package anywhere. It’s that time of year again… NAMM Time! … and that means new and exciting models from Epiphone! The following new models of Acoustic-Electric Guitars for 2006 were introduced at the Winter NAMM Show in Anaheim, California. Check them out!